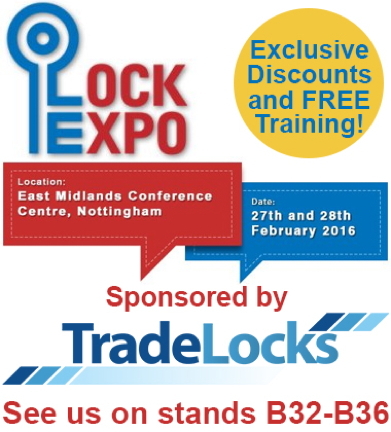 As this year's Lock Expo sponsors, Tradelocks will be showcasing their range of innovative tools and products as well as some very special offers and FREE tool demonstrations. 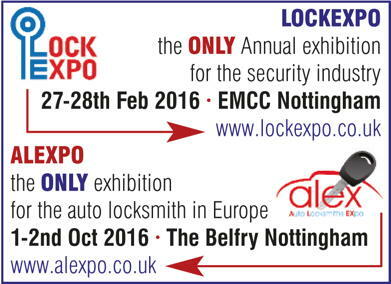 The countdown is on for the annual Locksmiths Exhibition on the 27th and 28th of this month. Now in its seventh year, the Expo will see industry leading suppliers and manufacturers showcasing the very best in locksmithing tools and products. Offical distributor of next generation auto diagnostics solutions. Visit us and discuss your requirements, training on the equipment and see our special show discounts. 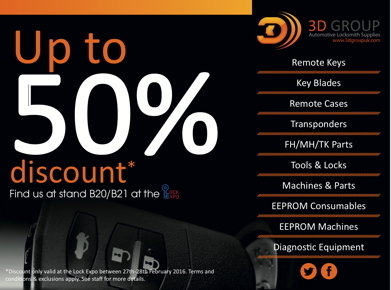 Lockdecoders will be exhibiting not only all 4 of our hugely popular Miracle keycutting machines but also our new SuperMerc range as well as the SuperVag package – those enabling easy solutions to many lost key problems on Mercedes and VW group vehicles. We will also be talking about our VW Crafter and Mercedes key emulators, a cheap and simple solution to a major problem on those vehicles. In addition we will be showing off the many and innovative opportunities for locksmiths to use our large range of Magic engravers for additional shop footfall, coining keys, tags of all kinds, even sign making. Kate and Andy Thurling supply high quality mechanical push button locks that have been tried and tested in the field for the last 16 years. They are easy to fit and offer high levels of reliability backed up by a five year guarantee, giving you a trouble free installation. Lock Doctor bring a range of Auto Locksmith solutions to the market. Specialising in the supply and support of high quality tools, including the industry leading Tango, Orange 5 & SuperVAG diagnostic programmers, offering express service on software requests. Suppliers of a full range of 2in1 picks, transponders and remotes. Advanced Access Ltd are a specialist supplier of all things Access Control, Door Entry and Electric Locking to the UK locksmiths market. We pride ourselves on excellent customer service, with our friendly and experienced team giving you the best advice, the right products at very competitive prices. Our ‘One Stop Shop’ approach ensures we can provide you with total security solutions for all your installation needs.